Bone-in chicken thighs are one of the easiest and most forgiving meats to prepare. The bone and fat content of the meat yields a juicy result that allows for a large margin of error in terms of bake time. 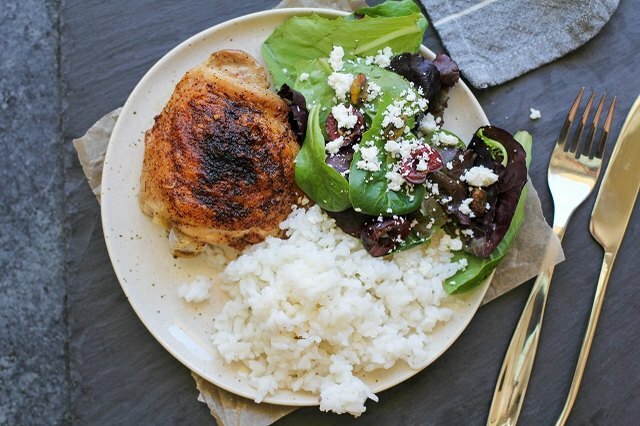 All it takes to prepare amazing chicken thighs is a simple dry rub and 30 minutes in the oven. This method ensures that you and your family will enjoy a protein-packed, delicious dinner without having to slave away in the kitchen for hours on end. 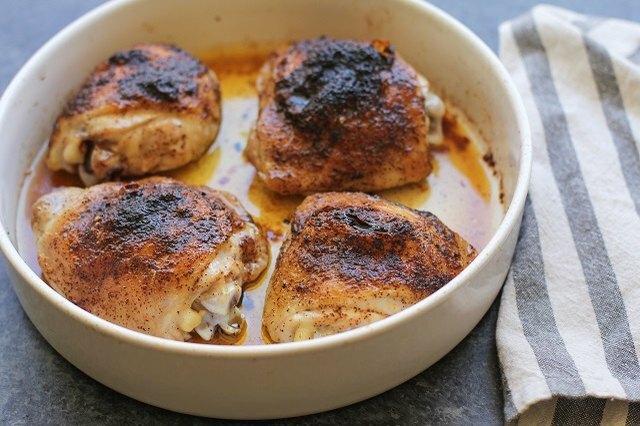 Bonus points: chicken thighs are one of the most affordable cuts of poultry, and provided you enjoy dark meat, it is also arguably the most delicious. You can use any of your favorite seasonings or store-bought blends, such as ground cumin, curry powder, Jamaican Jerk seasoning, Cajun seasoning, lemon pepper, dried herbs, and so forth. 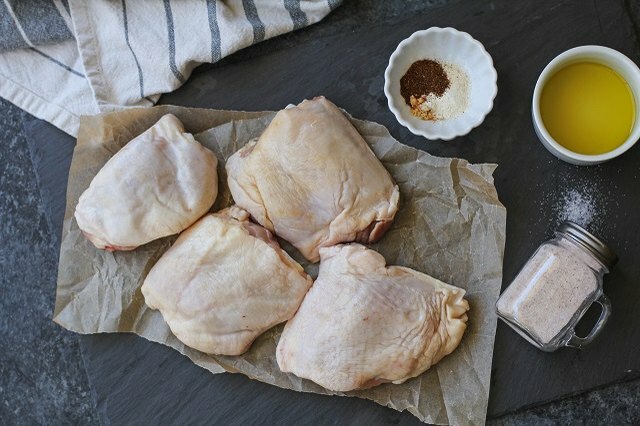 While it is not necessary to marinate bone-in skin-on chicken thighs, you can marinate the chicken for 1 to 8 hours using your favorite homemade or store-bought marinade. Preheat the oven 375° Fahrenheit and lightly oil a casserole dish. Stir together the seasonings and salt in a small bowl until well-combined. Drizzle the chicken thighs with oil and use your hands to spread it over the flesh so that the full surface of each thigh is coated. Sprinkle both sides of each thigh with the seasoning and place in the oiled casserole dish. Place the dish of chicken on the center rack of the preheated oven. 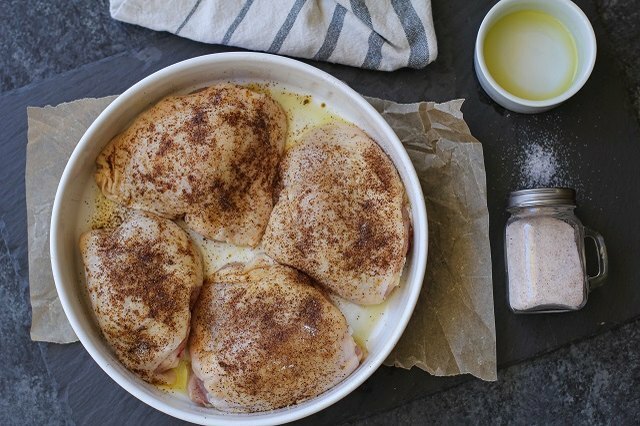 Bake for 30 to 40 minutes, or until the internal temperature of the chicken reaches 165° F. Most chicken thighs should only require 30 minutes of bake time, but thicker thighs may require more. To accurately tell the temperature of the chicken, insert a meat thermometer into the thickest part of the meat, without touching bone. Allow it to sit until the numbers (or dial) stop moving. For crispy skin, turn the oven onto the broil setting once the chicken is finished cooking, and move the chicken to the shelf that's second closest to the top. Broil for 1 minute, or until skin is golden-brown and crispy. Once the chicken has finished cooking, remove it from the oven and allow it to rest for 10 to 15 minutes. This ensures the juices in the chicken distribute throughout the meat, which makes for a tender, more juicy result. Note that the chicken will continue cooking and will raise in 5 to 8 degrees in temperature as it sits, so bear this in mind when determining how long to bake the chicken. 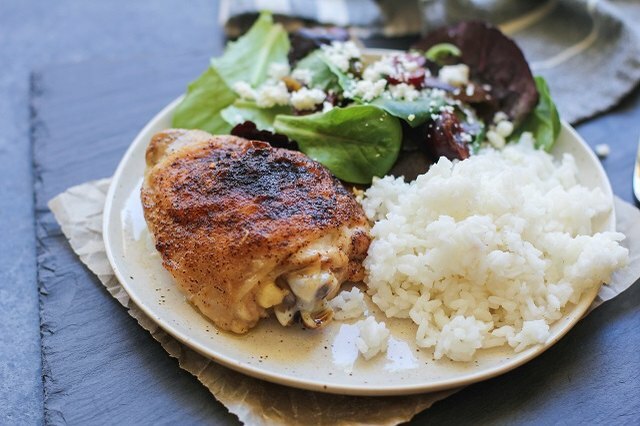 Serve the chicken thighs alongside your favorite side dishes, such as steamed rice and a green salad.